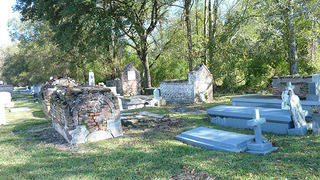 The cemetery of St. Michael's Archangel Church in St. James Parish, Louisiana. St. James Parish, Louisiana was created in 1807, and is made up of a scattering of small towns in a largely rural, agricultural area that straddles the Mississippi River midway between Baton Rouge and New Orleans. It’s known to many as the heart of Cajun Country. 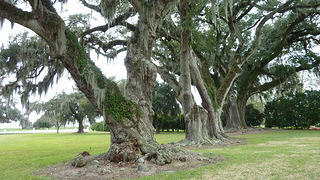 Oak trees on the grounds of Manresa House of Retreats. The National Register of Historic Places lists 22 sites in St. James Parish, but unfortunately, many of the homes on the list no longer stand. They became victims to fires or were torn down. My own quest to learn more about the sites that I grew up gazing at from a car turned up decades-old brochures and books by local historians long gone, or minor anecdotes that have been passed around by word of mouth. Perhaps the most noteworthy sites on the register are religiously affiliated—four in total. St. James Parish, as one may imagine, has a majority Christian population, predominantly Catholic, with a history of early settlements from the Marists, Jesuits, and Methodists dating back to the 1700s. The community takes great pride in its faith, so it’s no surprise that there has been a concerted effort by congregations over the centuries to preserve their churches. 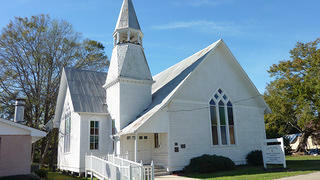 “The churches probably have more monetary value and historical significance than even the plantations,” says Roussel. 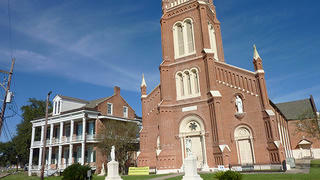 St. Michaels Archangel Church in Convent, Louisiana. The original St. Michael’s Archangel Church was built about a mile down the road from its current spot in 1809, and rebuilt in 1831 under the direction of Father Charles de la Croix for just under $20,000. The building is a cruciform basilica with a Gothic interior, a five-bay aisled nave, and Romanesque arches. Its octagonal spire was blown down in a 1965 hurricane and has never been replaced. Most noteworthy are its 500-pound bell from Belgium, the hand-carved wooden altars from France, a pipe organ believed to be the oldest in Louisiana, and the Lourdes Grotto Chapel, built by local architect and engineer Christophe Columb in 1876 and modeled off the famous religious site in France. Manresa's main building in Convent, Louisiana. Just a couple of miles down the road from St. Michael’s sits one of the most picturesque and significant sites in the area. The Manresa House of Retreats—formerly the site of Jefferson College, and once used as barracks by Federal troops during the Civil War—includes a stately Greek Revival main house and supplemental buildings, surrounded by gardens and dozens of oaks dripping with moss. It is the feature of many a postcard and painting. The grounds are not open to the public, so the property has a reputation of intrigue and awe to the thousands of people each year who stop for a photo on their drive past, and even for the locals who have never been inside. The main building, President’s House, and two gatehouses were built from 1831-1836 for the College of Jefferson. A fire in 1842 destroyed the main building, though it was quickly rebuilt within a year. 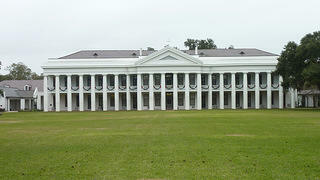 The three-story brick structure is painted white, and features a colossal Roman Doric order front gallery of 21 bays. The National Register nomination lists Manresa as one of a handful of large complex or institutional buildings left in the state in the Greek Revival form—there were thousands before the Civil War. The site passed through many hands since its first establishment and went through various iterations as a college under the state legislature and then the Marists. According to Leonce Haydel in his book La Paroisse de St. Jacques, “Jefferson College was recognized everywhere as one of the leading institutions of the south,” sending young educated men off to the state and national government, courts, and other professions. The site was purchased by the Jesuits in 1931, renamed Manresa, and became host to silent religious retreats for men, for which there is consistently a waiting list. Maintenance Manager Adrien Delbasty and his crew oversee the entire campus and grounds of 130 acres. One of the more awe-inspiring features of the property are the oaks, many in rows and planted over the course of 180 years. Some are said to be the biggest in the country. Delbasty has also overseen a complete renovation of the interior of the main house— including updated bathrooms for the 86 dorm-style bedrooms—while maintaining many of period-significant features throughout the buildings, from arches and baseboards to doors and furniture. The United Methodist Church in Lutcher, Louisiana. In the town of Lutcher, a few miles east on the River Road, is the Lutcher United Methodist Church, which humbly sits in the middle of a quiet, older residential neighborhood. This Queen Anne and Gothic Revival building was constructed in 1901, and according to the National Register nomination form, has undergone very few changes since then. The church is white-painted weatherboard on a concrete foundation, with a metal roof (which replaced original cedar shingles in the 1960s) and fish scale shingles. The nomination also highlights the building as a standout in the early 1900s, because it was one of few in the parish that followed a distinct architectural style, with its triple lancet windows, quatrefoil decorations, asymmetrical massing, and four-stage bell tower. The church itself was also recognized by the Methodist Conference as the first Protestant house of worship in the river parishes region. It was established in 1898. Across the Mississippi River, in the town of Vacherie, the Gothic Revival Our Lady of Peace Catholic Church makes its presence known with its 70-foot bell tower. Construction was completed in 1900 at a cost of $43,000. The few minor changes made to the church since its original construction include a new ceiling that followed hurricane damage and the addition of air conditioning. 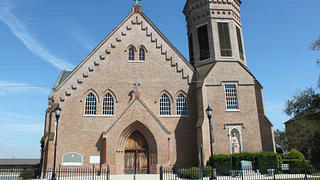 The church was nominated to the National Register in 2013 for its standing as the single architecturally significant building in the town of Vacherie, and for its status as the only entirely Gothic Revival structure in St. James Parish. In addition to its architectural history, the church is known for its consistent support of racial unity and integration, which dates to its construction in the 1890s. The National Register nomination form provides a thorough account of how Father Magin Palmer refused to let rampant racism in the Deep South come between his congregation members, and instead, found ways to bring them together through the church. While many of the historic sites in St. James Parish have slowly slipped into disrepair or have even disappeared, it seems unlikely that the residents will let their cherished religious sites suffer the same fate. As this quiet rural community strives to preserve its way of life in changing times, preservation of faith and houses of worship remains a top priority. Read more about these historic sites here .